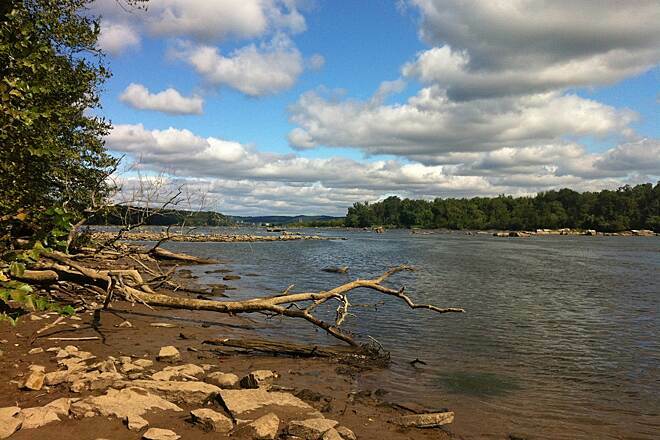 Maryland's Susquehanna State Park is recognized for challenging hiking and biking trails, camping facilities, rock outcroppings, boating, a museum and restored historical sites. 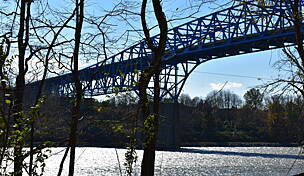 But none of these outshines the Susquehanna River, which sweeps majestically by, beckoning fishermen and nature lovers. 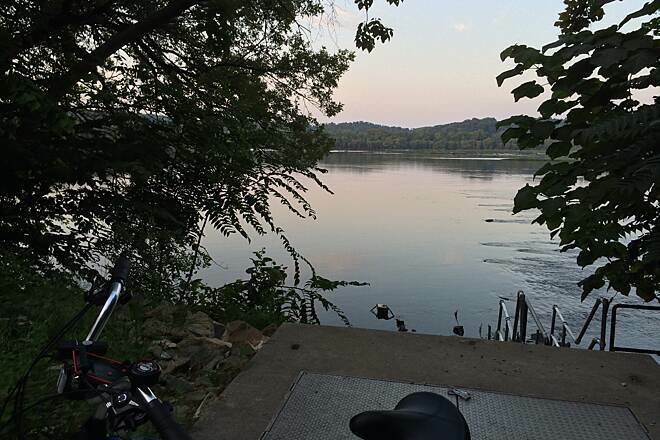 One way to take in the scenic river is by venturing out on the Lower Susquehanna Heritage Greenway Trail along the western bank. The Philadelphia Electric Company built the corridor in 1926 to transport materials from Havre d'Grace on the Chesapeake Bay to the construction site of the Conowingo Dam. 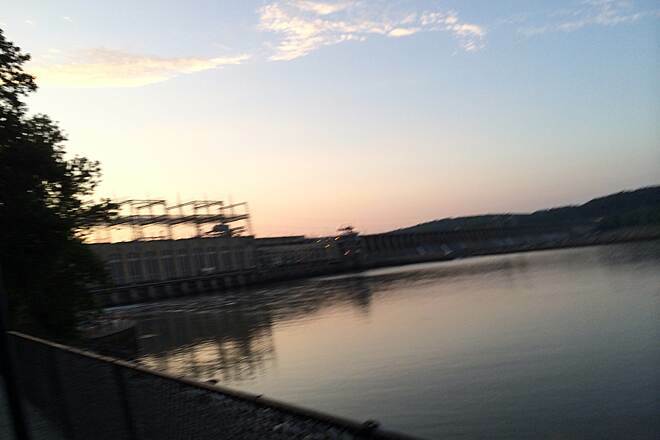 The dam was completed in two years and the rail line, no longer needed, became a victim of overgrowth and erosion until the Lower Susquehanna Heritage Greenway Trail was created. 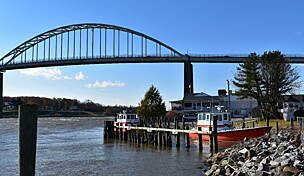 Eventually, it will extend 50 miles along both sides on the river; presently, only 2.5 miles are open. 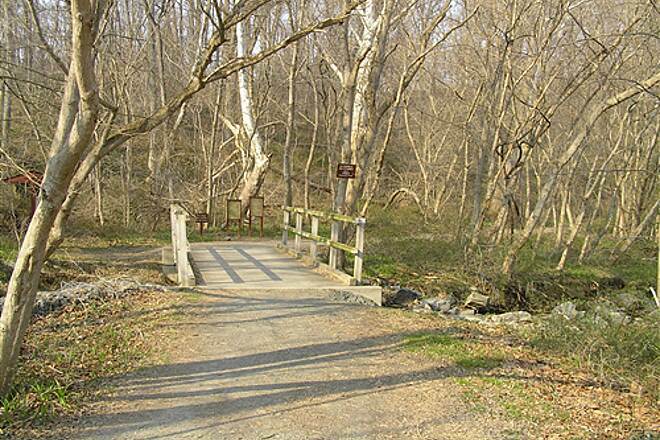 To start the trail from the south, in Susquehanna State Park, go to the north side of the Deer Creek bridge. 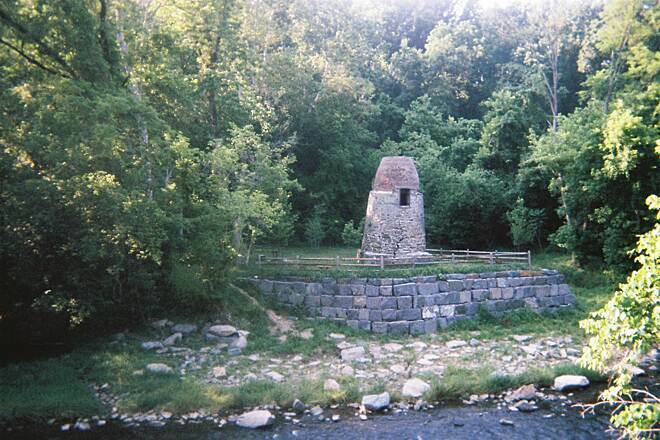 Near this end, where the trail travels inland to the sparkling Deer Creek, is the site of the early Stafford flint furnace, with a portion of the furnace still standing. 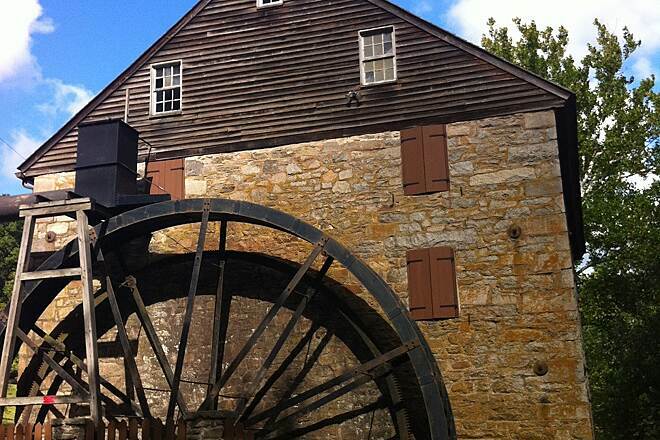 Along the way to the impressive 4,648-foot-long, 102-foot-high Conowingo Dam, you'll pass wooded wetlands harboring songbirds and abundant wildflowers, especially in the spring. 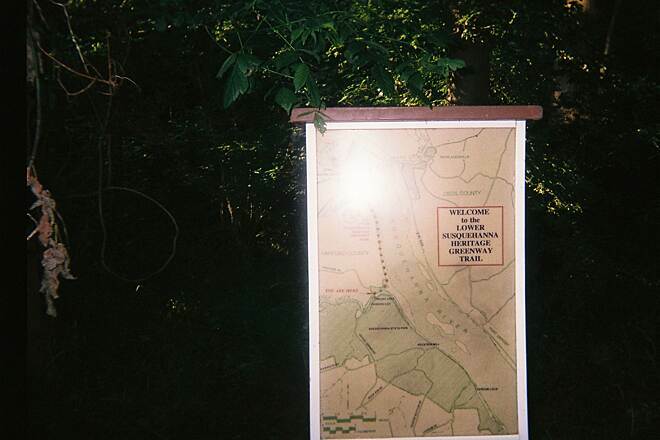 You may also spot old rail tracks and informational displays with historical and scientific details about the area. 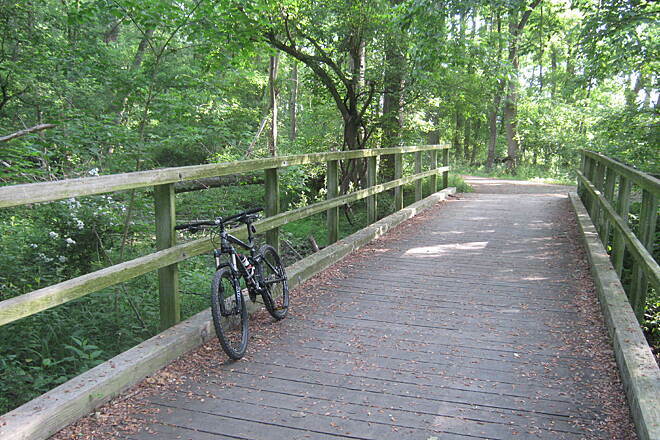 The wide, stone-dust trail is easy to walk or bike, and although there is a dense canopy overhead offering shade in the summer months, the river views are frequent and beautiful. 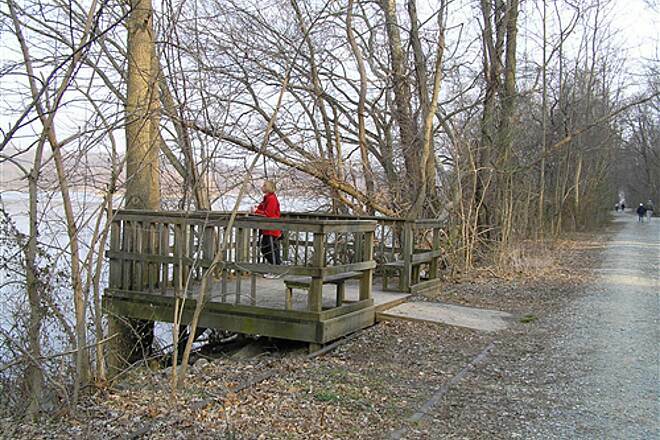 Near the northern end, a viewing platform provides river access to anglers, bird-watchers (the dam is a feeding ground for many varieties) and others. To start from the south, follow State Route 155 north from Interstate 95 and turn right on Lapidum Road. 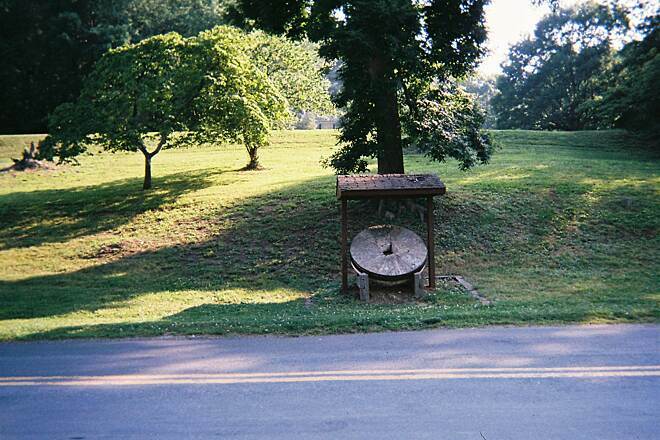 Take a left on Stafford Road and follow it to Susquehanna State Park and the Deer Creek picnic area on the north end. 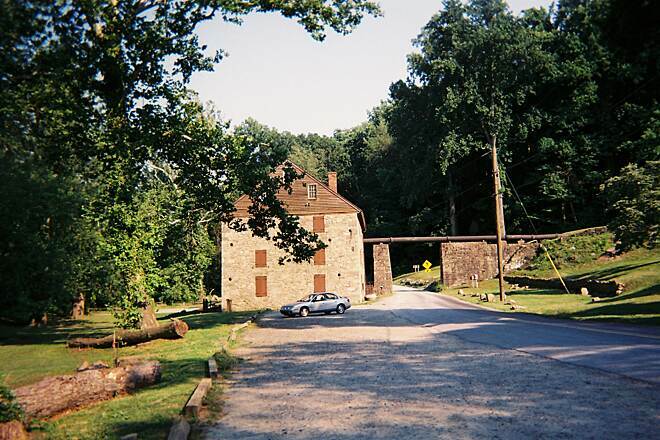 To reach the northern trailhead, take Interstate 95 north from Baltimore to Exit 85. Follow SR 22 north to SR 136, continuing north. Upon reaching US 1, go north. Turn right on Shuresville Road and then left on Shures Landing Road. 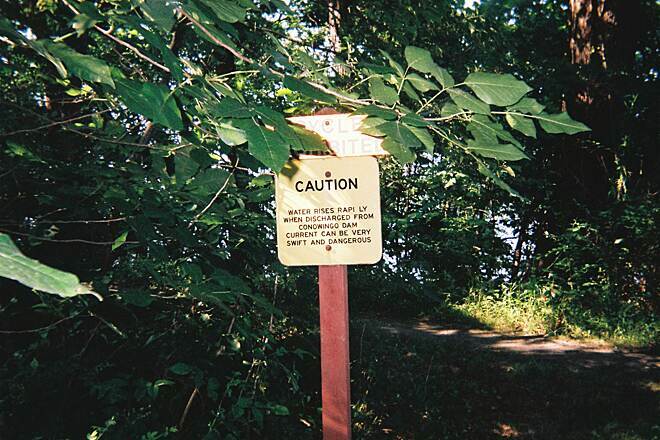 Follow this to Conowingo Dam and look for the trailhead just south of the dam at Fisherman's Park. 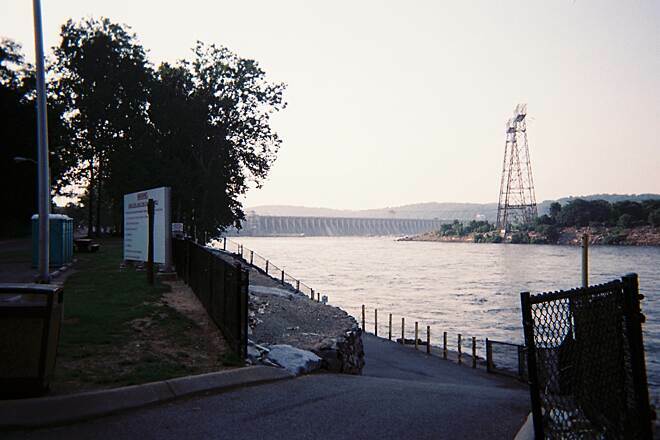 If you don't mind a cold weather hike, park at the base of the Conowingo Dam. From November through March, the area below the dam is one of the largest nesting locales for bald eagles in the eastern US and you can watch them as you hike. Look to your side as you head south and you will also see some lengthy depressions in the ground, remnants of a canal constructed there in the early 19th century. I have taken scouts hiking there repeatedly over the years. 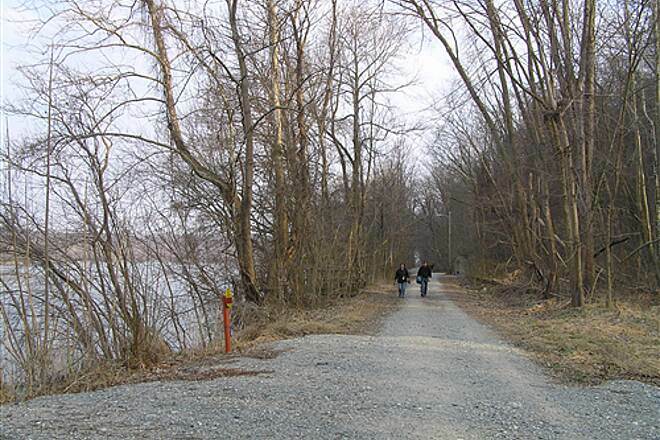 Our group just used this little trail to get from the Conowingo Dam to Havre de Grace. I usually love rail trails whether paved or gravel, but this is the first one I've ever encountered that had rails still IN the trail, parallel to the path of travel. Our tandem went down with ugly results for the couple riding it. One of our most experienced cyclists (over 100k miles) came close to doing the same. If you're going to bike it, slow WAY down, and take off your sunglasses because by the time you see the rail, it will be too late. My Wife and I had a picnic at Conwingo Dam and I brought a Mt Bike with me and did this trail. It is only about 2.5 miles but after talking to some locals with a some work it could go all the way to Harvre De Grace. I would not go out of my way to do this trail but I did have a nice little ride. Lot of shade and a lot of traffic Walkers, runners and a lot of bikers. It is flat and the surface is in good shape, some rails still in place. This would be a great trail to take a young family. 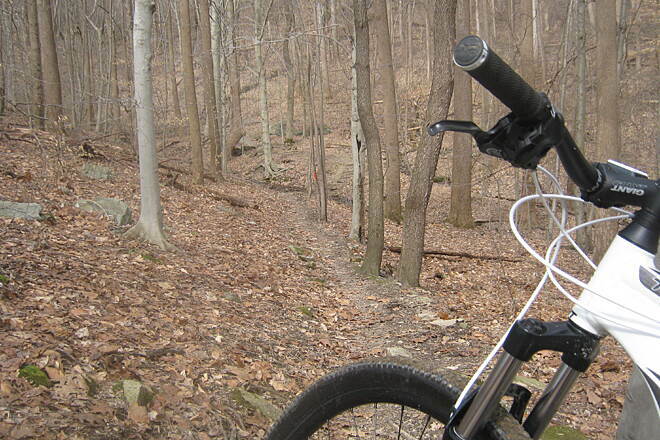 This trail starts out bumpy if you leave from the fishermans parking directly next to the conowingo damn. There is about one quarter mile of crush and run which would not be great for bikes with road tires. After the initial crush and run the trail is fairly decent. You will have to watch I a couple low spots for old wooden rail ties sticking out that could easily cause you to stop abruptly and or crash. 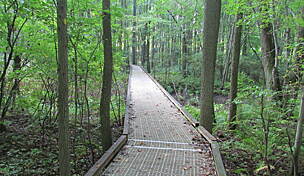 About half way down the trail is a wooden boardwalk that was put up because the area got very wet and flooded frequently. It is severely slopped in the begg ng and is very slippery as algae has formed omit without much sunlight to dry it. So be careful on this short boardwalk. After that the rest is easy and smooth sailing. 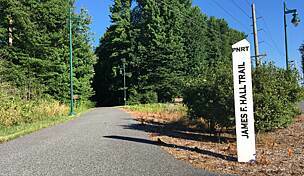 You can follow stafford road down to the boat ramp at the end of the trail to make it almost an even six mile run. The road isn't travelled much and is easy to ride. 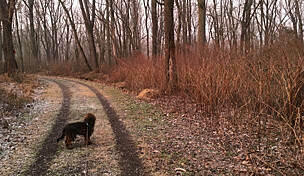 All in all the trails relatively flat with a few hsmall hills on the road part. Good views the whole way as you can see the water and wildlife. The deer are so tame they didn't even move more than 5 feet off the trail to let me pass. And if it wasn't for me nsisting they may have stayed put. Nice trail with a coup,e of hazards to watch for but very enjoyable and great sightseeing. 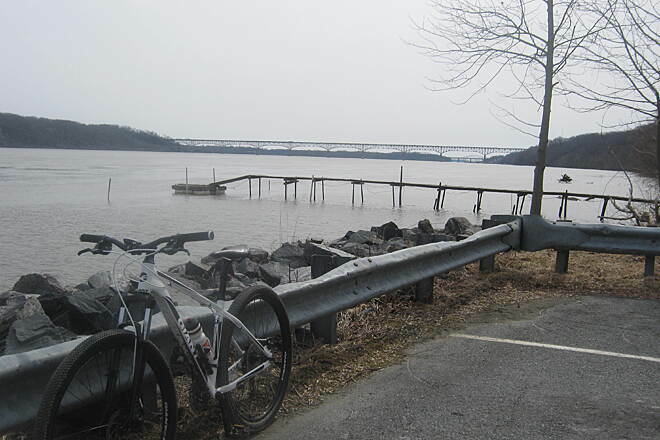 Built on an old rail line that was originally constructed to ferry workers and equipment during the construction of the Conowingo Dam, the Lower Susquehanna Heritage Greenway is a rail trail in the literal sense. 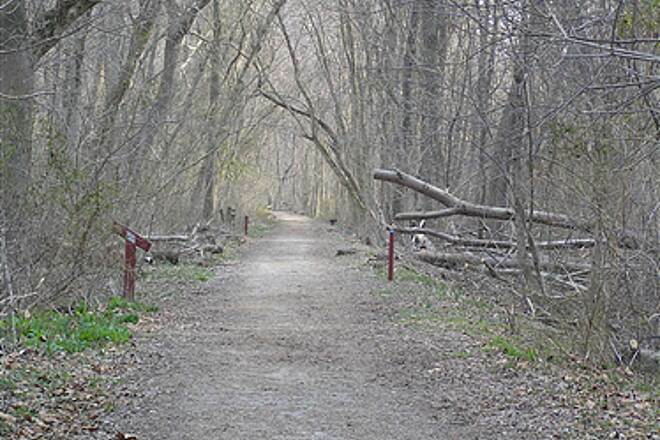 Despite being abandoned decades ago, the railroad tracks were left intact, and can often be seen immediately adjacent to, and in some places concurrent with, the trail. This makes for an unusual, and interesting, experience. 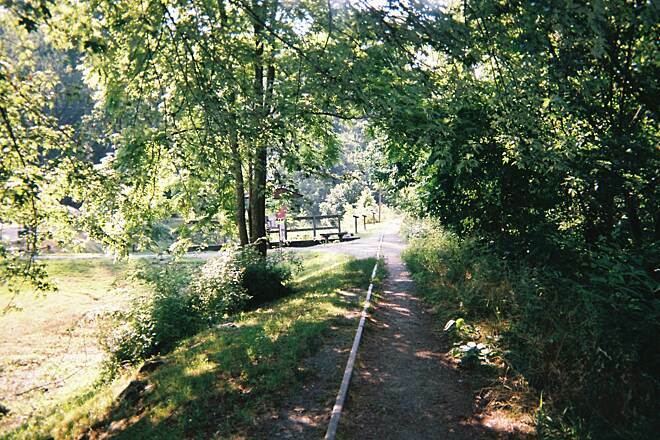 The trail itself has something of a split personality: the northern portion, which stretches from a parking lot just south of the dam (itself a site to behold), to a point 1.7 miles south, is a multi-use trail, with a level, crushed stone surface and amenities like benches and interpretive historical signs. 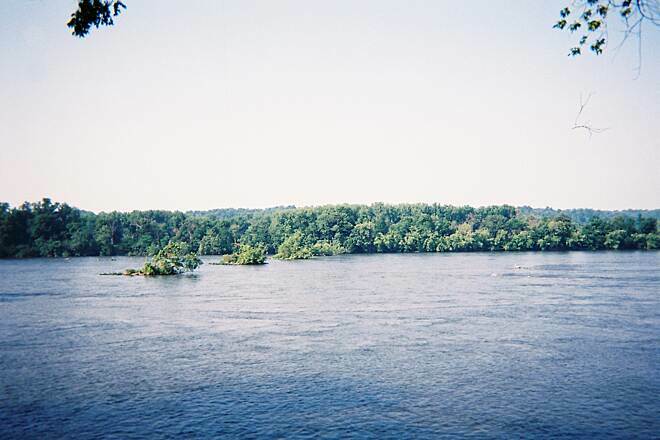 In addition to the old rail line, which runs parallel off the east side, this section is also noted for its lush forests and the fact that it is right next to the Susquehanna River. Anglers are a frequent site, and boats can often be heard whirring nearby in the summer months. 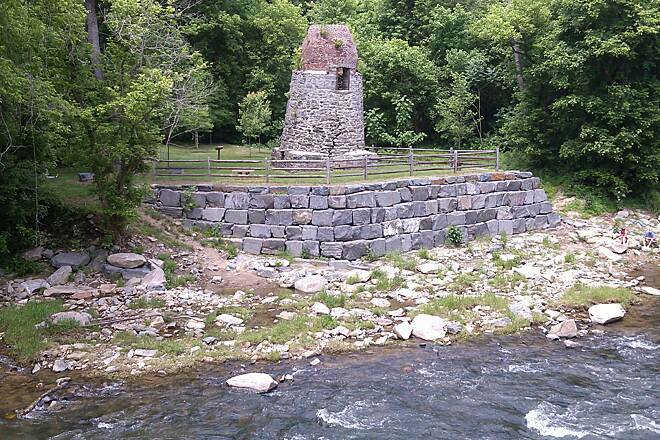 The trail later turns west and follows Deer Creek to the ruins of Stafford Flint Furnace, which was once used to bake flint mined nearby for use as building material and other purposes. 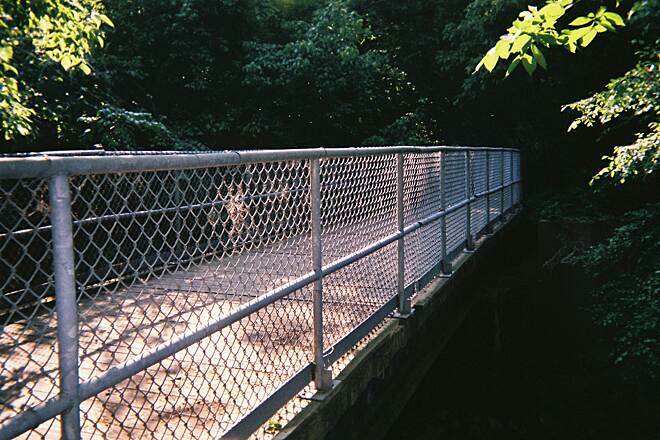 While this portion ends rather abruptly at nearby Stafford Road, parking is available directly across the bridge over Deer Creek. 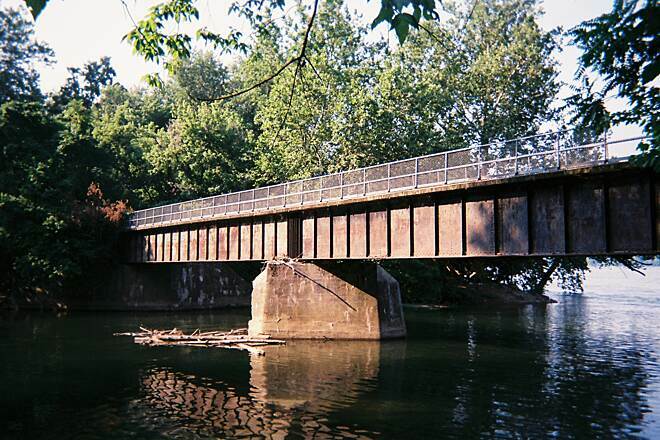 Those seeking a more adventurous experience should follow the trail back to a fork about 1500 feet east of the furnace, and continue south on the primitive footpath that is situated directly over the top of the railroad tracks. Paved only with dirt that was placed over the ties (users are still advised to watch their step), this less-developed section of the trail continues another 2 miles or so south to the Rock Run Grist Mill. 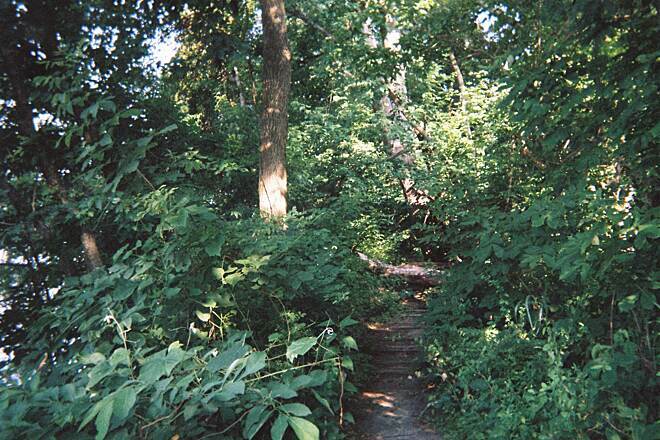 Here, the forests are denser, and the location more remote. These features, along with the rails, which are still visible on both sides of the path, create an eerie vibe, much like something out of an adventure movie where you are following a path to some long-abandoned mining operation or settlement. 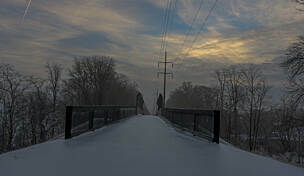 Civilization returns at the trestle over Deer Creek, which has since been converted to trail use and now includes a nice, wooden deck, anticipating eventual plans to upgrade the whole trail to multi-use status. The trail parallels Lapidum Road for another half-mile to the mill, which also features a nice parking lot. 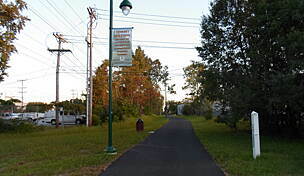 In addition to being a trail in its own right, the Lower Susquehanna Heritage Greenway also forms a section of the Mason Dixon Trail, a hiking path that extends from the Appalachian Trail at Whiskey Springs, PA, south and east to Chadds Ford, where it joins the Brandywine Trail. The blue blazes seen on many trees along the greenway mark the route of this trail. 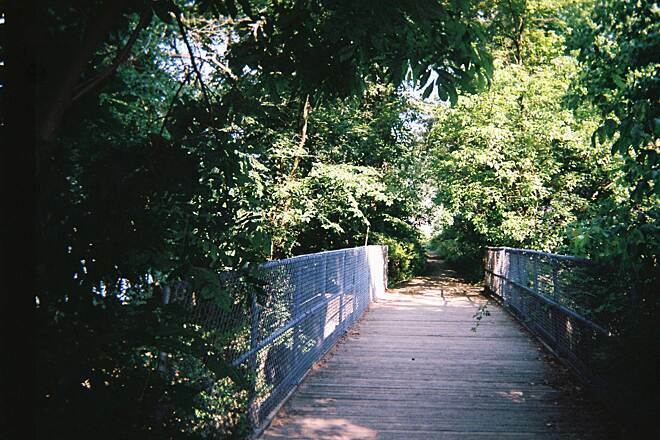 Highly recommended for users seeking to observe nature, explore history or simply enjoy a scenic trip along the southern reaches of the Susquehanna River in Harford County, the Lower Susquehanna Heritage Greenway Trail provides a cool, shady experience on warm summer days. 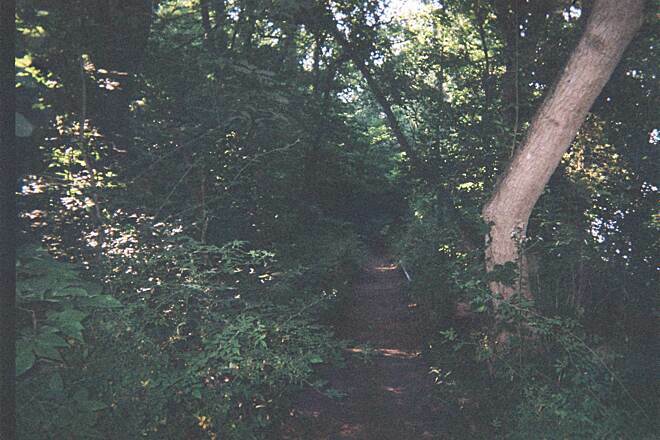 Beautiful paths winding through the park. 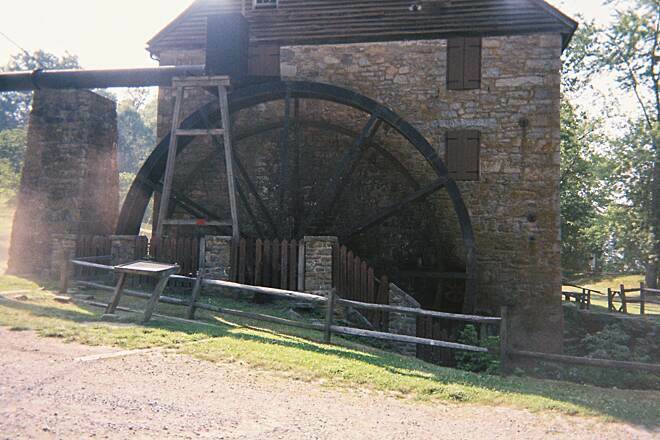 I ask that anyone traveling there takes care, especially on the "Land of Promise" trail as that is of great historical significance to the Wilson Family of Harford county and there is on going historical research going on in that area. If anyone finds artifacts or anything of historical importance please contact the susquehanna state park service and myself at carrie.wilson1006@gmail.com. 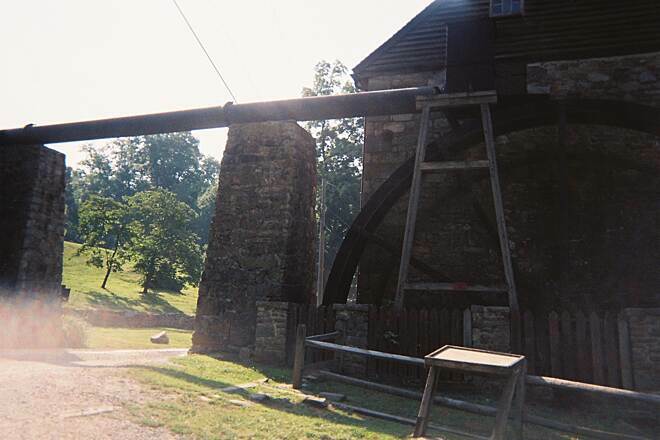 Enjoy the beautiful trails and the old stone walls that wind through the park! 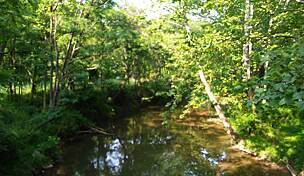 "Flat, easywalk, many Bald Eagles, and small woods birds and water fowl on the river. Always fresh signs of beaver, Pileated woodpeckers, various gulls, terns, herons, ducks, geese, margansers. Toilet facilites at north end. " "Read the description carefully, bike riders. 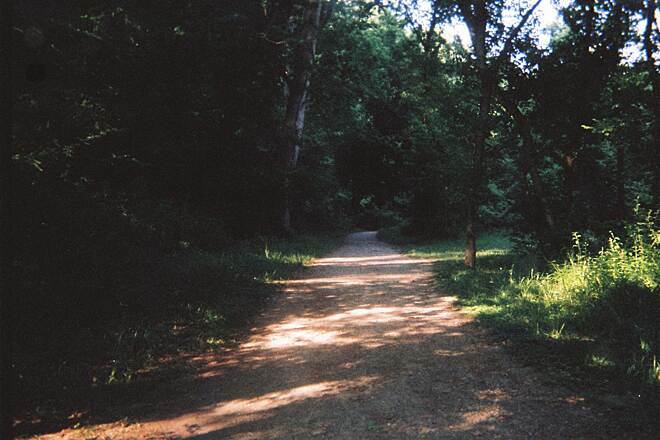 This is a beautiful hiking path in which only 1.7 miles look like the usual rail trail. 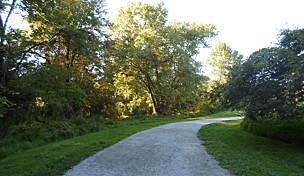 Mountain bikers will like the path to the Mill on the Southern end from the end of the gravel section on the North. 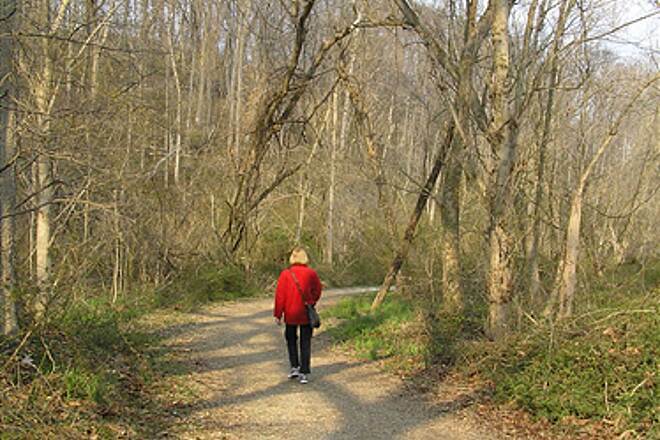 Leave this one to the bird watchers; get off the bike and walk it to really appreciate it. " 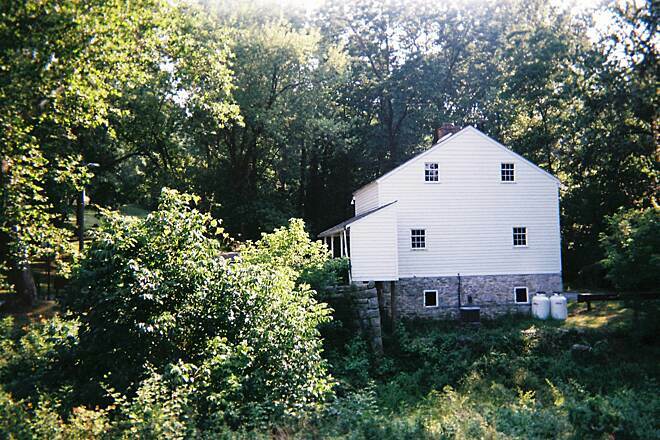 "This all narrow, wooded, blue-blazed trail runs 14 continuous miles from the Lapidum boat ramp/parking area on Tidewater at the south end of Susquehanna State Park, Harford County, northward through the hilly park and its colonial grist mill area, turning flat & crushed gravel for just the three miles along the river to Conowingo Dam. 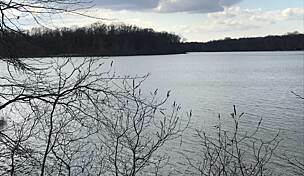 North from there, beyond the hilly and scenic Hopkins and Glen Cove areas, the trail reaches river views 440 feet above sea level. 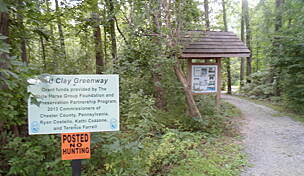 The actual trail ends in Broad Creek Scout Camp eight miles north of Conowingo and one-and-a-half miles north of the Paddrick Road/Route 623 parking area. 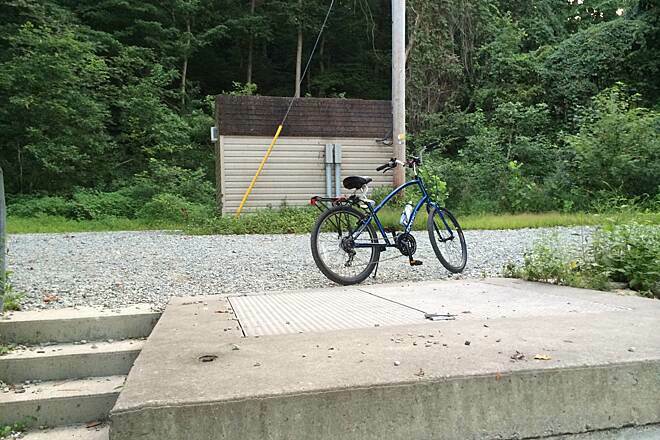 Only the three mile former railroad corridor below the dam has been widened and graveled by the state; the rest has been built and maintained for decades by volunteers with the Mason-Dixon Trails System. 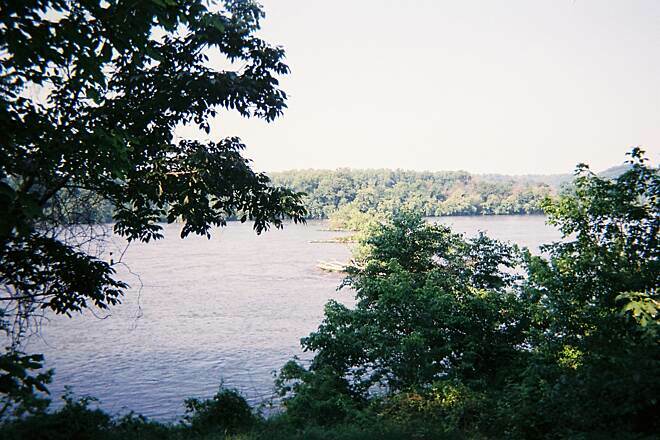 I have maintained the Conowingo to Broad Creek section since 1987. 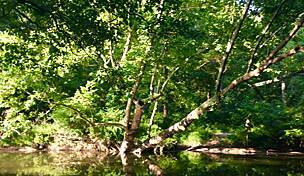 For youth group primitive camping at Glen Cove, call the Glen Cove marina at 410-836-3761. Bald eagles can often be seen on the Glen Cove to Conowingo Dam section of the trail, especially in the winter. "